Multi-functional. Apply to stretched skin for aging, extreme blister or wounds. Excellent for sealing Nose and Scar Wax or to old prosthetic appliances. Dries clear. I bought this but ended up modifying my costume so I didn't use much of it. I did use it during some test runs and it seemed to work like it should. It didn't have a terrible odor or anything unpleasant, but it does take a while to dry. You may want to use an old makeup brush to dab on some powder if you need it dried quicker. Overall the product seemed to work as it should and was brand new when I received it. It appeared fresh and didn't have the tell-tale signs of being old and dried out. 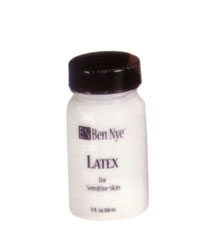 I would be happy to buy this again if I ever needed more liquid latex in the future.